After His Resurrection, Christ remained with His disciples for forty days, appearing to them on different occasions. On the fortieth day, while blessing them, He ascended into heaven (Holy Ascension, celebrated forty days after Pascha, on the Thursday of the sixth post-Resurrection week). Christ had promised His disciples that, after ascending into heaven, He would ask the Father to send down the Holy Spirit (Parakletos, or Comforter) to guide the disciples into “all truth” (John 16:13). This descent of the Holy Spirit is commemorated on Holy Pentecost. On that day, the Church celebrates Her foundation on Earth as the Body of Christ. Holy Pentecost, one of the 12 Great Feasts of the Church, is also known as the Feast of the Holy Trinity, as it constitutes the third revelation of the Holy Trinity – the other two being the Baptism and the Transfiguration of Christ. It falls on the eighth Sunday after Pascha, the fiftieth day from the Resurrection of our Lord. On Pentecost Sunday, a Vespers service is conducted that includes the kneeling prayers. In some parishes this Vespers is not celebrated on Sunday evening, but instead right after the end of the Divine Liturgy. These prayers mark the re-introduction of the practice of kneeling during the Liturgy, which had been suspended after Pascha. One prayer, among all the prayers of the Orthodox Church, is addressed to the Holy Spirit, and this is the prayer “O Heavenly King”. This prayer is also suspended after Pascha. It is re-introduced on the Vespers on Pentecost Sunday. The week following Pentecost Sunday is a non-fasting week, when all foods are consumed on all days with no restriction (for more details see our post on Orthodox fasting). 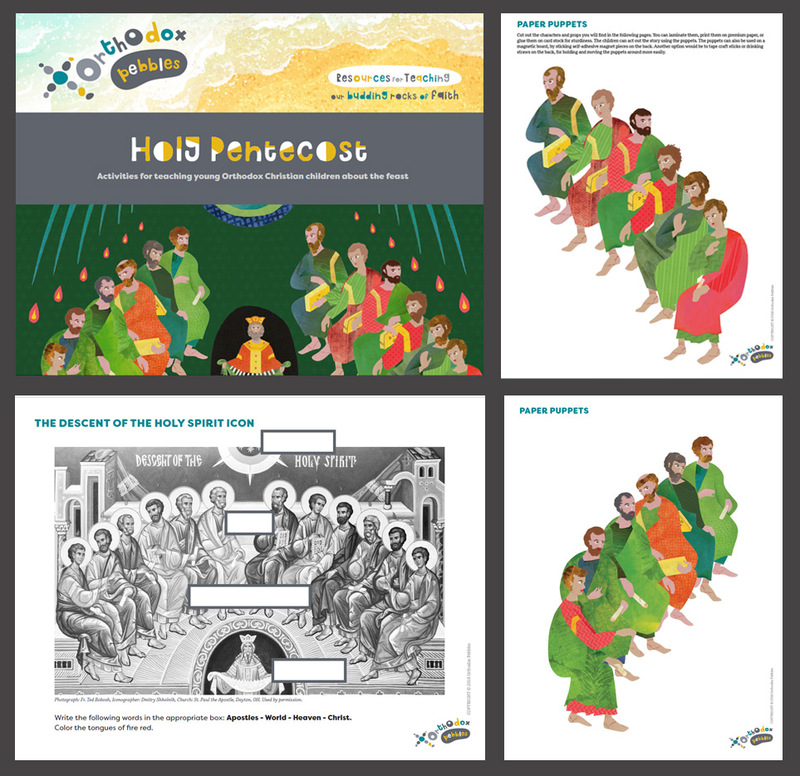 Using our printables, a lesson on Holy Pentecost for young children could be set up as follows. Point out and name the most important parts of the icon: The Apostles, the heaven, the tongues of fire. Name the Pentecost feast and explain that it is the descent of the Holy Spirit on the Apostles. Point to the World in the icon, and also point to Christ’s empty seat, explaining why it is empty. Demonstrate some knowledge of the “O Heavenly King” prayer. State that Holy Pentecost is the birthday of the Church. Explain that Orthodox Christians receive the Holy Spirit when they are baptized, and also when they take part in the mysteries of the Church, such as Holy Communion and Confession. First, we would introduce the story using the paper puppets. If we had time, we would ask some of the childen to act out what we just showed them, with the help of the puppets. At the end of the introduction, we would show the real icon and ask the children to identify the persons and details. Then, we would do the printable activities: Icon worksheet (for the older children), Cut and Glue (for everyone). A game to reinforce the “O Heavenly King” prayer would conclude our lesson (see below). A Pentecost lesson is a wonderful opportunity to familiarize the children with the prayer to the Holy Spirit, “O Heavenly King”. Our printables can help with this task. Here are some ideas on how to help the children learn the prayer. Chant the prayer together a few times. While reciting the prayer, stop suddenly. See if the children can remember the next word or phrase. Write the prayer on a board, using different colors for different verses. Write the prayer on a board, then erase a phrase each time you repeat the prayer, until the board is blank and the children are saying the prayer by memory. Devise motions to help the children remember different parts of the prayer. For children who can read, you can use our printable Holy Spirit Prayer Scramble to help the children learn the prayer. Print out the page and cut out the rectangles. Scramble them up, then the children will try to put them back into the correct order. Beforehand, it might be helpful to write the whole prayer on a board, or print it out from our printables and place it on a visible spot inside the room, so the children can refer to it, if they forget a part. Prayer scavenger hunt: Cut out the phrase cards and tape them randomly on the walls of the room. The children must collect the cards and put them in the correct order. To make it easier, you can print out a full page – with the cards intact – which they can use to place their collected cards on. If playing this game with teams, print out several copies of the phrase cards on colored paper, one color per team. Cut out the phrase cards, mix up the colors, and tape all the cards on the walls of the room. Each team must collect the cards of its own designated color, then put them in order. Stacking tower: Print and cut out the prayer cards from our printables. Tape each card on the outside of a plastic cup – half of the cards face up, half face down – or tape the cards on building blocks. Have the children stack the cups (bottom to bottom, top to top), or the building blocks, so they can read the prayer in the correct order. If playing with teams, provide each team with its own set of cups or building blocks. The first team to complete a tower wins. Bowling: Hide each phrase card under an upside down paper cup. Each child uses a small ball (a tennis ball works well) to knock over the cups. When s/he knocks over a cup, s/he takes the card from underneath it, and places it at a designated spot, in the correct order. If doing this activity in a group setting, the children can be separated into competing teams, each with its own set of phrase cards and cups. Toss game: The phrase cards are spread out on a large piece of construction paper on the floor. The child uses a small beanbag (a sock filled with rice works works just fine) to aim at the cards. When the beanbag lands on a card, the child takes it and places it at a designated spot, in the correct order. This can be again turned into a small competition between teams, if desired. Basketball: The phrase cards are scrambled up and put into a bag, jar, or cup. A container such as a laundry basket is placed on a high spot, such as a table. Each child throws a small ball at the container. If the ball lands into the container, the child gets to randomly pick a card from the bag/jar/cup, which s/he then proceeds to place at a designated spot, in the correct order. In a group setting, if the child misses, s/he goes at the end of the line and waits for her/his turn to try again. Fifty days after our Lord’s Resurrection, the disciples were gathered in a room, in Jerusalem. They were about 120 men and women, including the Theotokos. The Holy Spirit appeared in the room as a rushing mighty wind, then tongues of fire descended upon the disciples. Until that moment, the disciples were confused and frightened. They hadn’t really understood what Christ’s life, death and Resurrection actually meant. The Holy Spirit filled all of them with Himself, revealing to them the whole Truth, and turning them into Apostles (Apostle = he who is sent). St Gregory Palamas tells us that each Apostle received his own gift and the ability to speak in tongues, according to his character and mission. They immediately understood everything, and courageously set out to preach the Gospel of Christ to the whole world. Following the descent of the Holy Spirit, the Apostle Peter gave his first sermon to the people of Jerusalem, and 3,000 people were baptized. Together with the Apostles, the Theotokos, and the pre-existing followers of Christ, they formed the first Church. On Pentecost, we have the first ordination of the Apostles as Bishops, directly by the Holy Spirit. According to Orthodoxy, without priesthood there can be no Church. Since then, Orthodox Christians receive the Holy Spirit during the Mystery of Chrismation – when we celebrate our personal Pentecost. After Chrismation, it is the Orthodox Christian’s free choice and personal responsibility to keep on receiving the Grace of the Holy Spirit, by consciously following the Will of God and continuously participating in the sacraments of the Church – most importantly Holy Confession and Holy Communion. The Pentecost icon is also called the Descent of the Holy Spirit. It is not a literal depiction of the historical event as it happened on the day of the Pentecost, but rather a depiction of the whole Church, with deep theological meaning. The Apostles are shown in the upper room, sitting in two groups, facing each other. Their semi-circle shape is important: They are looking at each other, signifying the unity of the Church. At the same time, at the bottom of the icon, the semi-circle opens, so this unity can also include the viewer, the faithful member of the Church who is venerating the icon. The blue semi-circle at the top of the icon signifies heaven, from where the Holy Spirit descends in the form of rays. At the end of the rays we can see the tongues of fire above the heads of the Apostles. The two disciples on the bottom of the semi-circle are Philip and Thomas, both young Apostles. Their position, opening up to the viewer, signifies that the Grace of the Holy Spirit is offered through the Church to all Her new members. These young Apostles on the bottom are further apart between them and further away from heaven, compared to the older ones on the top. This signifies our spiritual progress within the Church; as we progress spiritually, we get closer to each other and to God. On the top center of the Apostles’ semi-circle, between the two Apostle groups, there is an empty seat: It belongs to the Teacher, Christ, Who was not bodily present at the moment of the Pentecost, but is eternally present as the Head of the Church. On the left and right of Christ’s seat, we see the Apostles Peter and Paul, considered by the Church as the first among the Apostles. Peter signifies the Jews and Paul the Gentiles to whom the salvific message of the Church was preached. In many versions of the Pentecost icon, the Apostles are shown without a halo, as in all the icons before the Pentecost. This symbolizes that the Holy Spirit hadn’t yet descended upon them. On all the icons after the Pentecost, the Apostles appear with a halo, signifying the Grace of the Holy Spirit. We can see Saints Luke and Mark the Evangelists (third from the top, left and right respectively), as well as St Paul, even though they weren’t physically present on the day of the Pentecost. Again, this signifies the unity of the Church. St Paul and the four Evangelists are holding books, symbolizing their writings. The rest of the Apostles are holding closed scrolls, signifying their verbal teaching. At the bottom of the icon there is a crowned figure of an old man inside a dark cave: This is the Cosmos (the whole world), sitting in the darkness of sin, waiting to hear the Gospel of Christ. He was made old by the original sin; his royal crown signifies the sin which ruled in the world until the establishment of the Church. He is holding a piece of cloth filled with twelve closed scrolls; again, these scrolls signify the teachings of the Apostles. and through them, drawing all the world into Your net. O Loving One, glory be to You. Holy Pentecost, OCA article by Fr Alexander Schmemann. Sunday of Holy Pentecost, GOArch article. The Holy Spirit and His Variety of Gifts, GOArch article by Fr George Mastrantonis. The Meaning of Icons, by L. Ouspensky and Vl. Lossky, St. Vladimir’s Seminary Press. The Pentecost Icon as an Icon of the Church from A Reader’s Guide to Orthodox Icons. The troparion of the feast, chanted by Fr Apostolos Hill. The prayer to the Holy Spirit, chanted by the choir of St Nicholas Russian Orthodox Church, McKinney, Texas. Special thanks to Sister Vassa Larin and Y2AM for allowing us to embed their videos in our webpage. Sincere thanks to Fr Ted Bobosh and iconographer Dmitry Shkolnik, for their gracious permission to use the icon of Pentecost which adorns Fr Ted’s church, St Paul the Apostle in Dayton, Ohio.